A larger, thicker organic oatflake. 100% wholegrain oats. Ireland's no.1 porridge oats. A bowl of Flahavan's is all about taste Creating that taste starts with sourcing the finest quality oats. Our mill, situated in a small village in Waterford, has been an independent family business for over 200 years. We use milling techniques handed down over the generations to create perfect porridge oats. A delicious, creamy breakfast At harvest time we take in our new season's oats, drying and storing them with special care for the year ahead. Our unique way of milling gives our oats their natural, wholesome texture and flavour. The result is a warm, nourishing bowl of Flahavan's - a delicious breakfast with a creamy taste that we hope you will enjoy. This is why we're Ireland's favourite porridge oats. Jumbo Oats Our Organic Jumbo Oats are a larger, thicker oat ideally suited for preparation as a delicious porridge with more bite, or as an ingredient in muesli or cooking. Organically grown At Flahavan's, we always strive to source high quality, locally grown Irish organic oats. However, there is no occasionally a shortfall in the supply of Irish organic oats. For this reason, from time to time we may have to source our oats from certified organic growers in neighbouring countries. Rest assured, the quality of our organic porridge oats is never compromised. 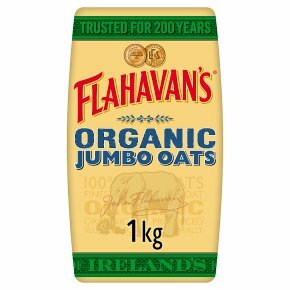 Serves 2Stir one cup (80g) of Flahavan's Organic Jumbo Oats into 2 1/2 cups (550ml) of cold water/milk. Bring to the boil and simmer of 5 minutes stirring continuously. Serves 1Stir 1/2 cup (40g) of Flahavan's Organic Jumbo Oats with one cup (220ml) of cold water/milk in a deep bowl allowing over an inch at the top of the bowl for the oats to cook. Microwave on high for 2 1/2 to 3 minutes, stir and serve. This is based on a 900W microwave. Cooking times will vary according to wattage. As with any hot product please be careful.